SMS Holdings is happy to announce the opening of its first Your Pie restaurant in downtown Nashville, TN! 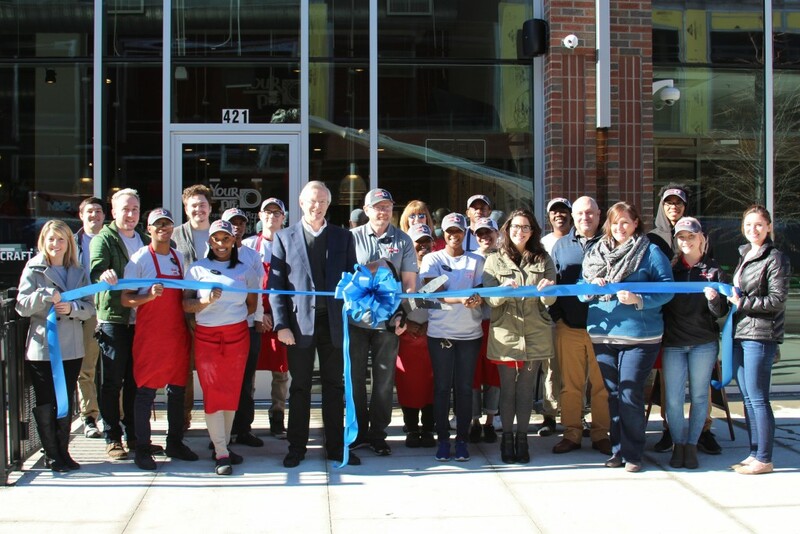 Your Pie, the original fast casual pizza concept, opened on January 12 at 421 11th Avenue North in Capitol View. Days leading to the Grand Opening, Your Pie hosted ‘Dine and Donate’ events. During each shift, the restaurant served free pizzas for up to 200 registered guests and collected monetary donations on behalf of Second Harvest Food Bank of Middle Tennessee. On Grand Opening day, SMS Holdings celebrated with an official ribbon cutting ceremony. Representatives from the Nashville Chamber of Commerce, Second Harvest Food Bank and Boyle Investment Company were alongside with SMS Holdings Corporate executives and employees. Kevin Parker, General Manager of Your Pie Capitol View, presented a $4,000.00 check to the Second Harvest Food Bank of Middle Tennessee, which will provide approximately 16,000 meals to the hungry throughout Middle Tennessee. Inspired by his Italian honeymoon, Your Pie was founded in 2008 by culinary entrepreneur Drew French, who aimed to create an innovative restaurant concept offering high quality, brick-oven pizza at incredible speed. Your Pie began franchising in 2010 and now shares its mission with more than 50 stores across the United States, with another 50 locations in development. While family recipes and Italian culture helped lay the foundation for its processes and exceptional quality, Your Pie has continued to build upon this foundation. With new ingredients, innovative recipes and endless choices, Your Pie creates a one-of-a-kind experience with traditional roots, but a flair all its own. Your Pie uses hand-tossed dough, only fresh ingredients and homemade pizza sauces and salad dressings. They also offer vegan, vegetarian and gluten-free pizzas, as well as traditional pizzas, chopped salads and paninis. All menu items, including its rotating seasonal menu, are inspired by family recipes from the Italian island of Ischia. The brand also offers local craft beer, wine and Italian-style gelato pairings designed to perfectly compliment guests’ custom pizza creations.